It’s been a full week since my surgery and things are looking up. My swelling has decreased dramatically. I can open and close my lips quite easily and I have feeling in my top lip again. The downside? That very lip is split wide open due to the swelling from the past few days (because I didn’t get Vaseline on it soon enough), so that’s the most painful part of my day right now. My nose and chin keep getting itchy these days as well, so I scratch them in an attempt to remedy the sensation. That’s great and all, except they’re both still completely numb, so I can’t actually feel myself scratching them. Perpetual itch. I went and saw my sister and her children yesterday for a few minutes. I find it amusing how adults can understand me, but the young ones just can’t wrap their minds around the fact that a person can talk without moving their mouth. The only acceptable explanation I’ve found so far has been to tell them my teeth are glued together. My sister also kindly reminded me that my puffy cheeks make me look like a cartoon character. Thank you for that. I’ve stopped attempting to speak in words and started speaking in tones and murmurs. I’ve discovered that the mere inflection in my voice is enough for most people (sans children) to figure out what I’m saying. I really appreciate the people who listen to me, clearly don’t understand what I just tried to say, and then nod and say “yes, okay” as if they had heard me perfectly fine. I see right through your false responses! Oh, and yesterday I had some tomato soup for lunch. What a welcome change! I also went for a little drive, but I was a little lightheaded during the trip because I was so hungry, so in hindsight, that may not have been the best idea. I have my very first post-op appointment with my surgeon tomorrow morning. I’m hoping he’ll put looser elastics on so I can start eating a little bit more. To sign off, I’ll leave you with a simple, yet profound revelation that struck me at about 11 o’clock last night. It goes something like this: codeine is straight from Heaven itself. Seriously. I am currently two weeks post op and my biggest annoyance is the Unitchable itching caused by the nerves waking up. Did you ever have this problem? If so, how did you deal with it?? Reaching day 7 today; found out I can drink from a glass as long as I’m watching myself in a mirror. My lips have been great: I really really recommend AQUAPHOR to anyone that’s going to be going through this. It’s petroleum based rather than vaseline based, but my lips “shed” at like…day 3, and the skin below was very very soft and healthy, and has remained so as I’ve kept using it. 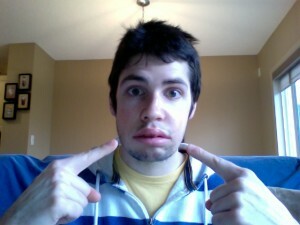 I’m finding I’m having some problems with either a stitch or my top lip catching on my braces though–owwww. :p I’m also incredibly sensitive to cold anything and have started trying to warm my smoothies/shakes up before drinking, as well as drinking lukewarm water. Didn’t even attempt to talk til yesterday. Soup is the best thing in the world. Hi I had double jaw surgery, thought it was single so that was a bit of a shock. I’m on day 7 now, I’ve got most of my feeling back now but I’m using ice packs which are my favourite thing in the whole world at the moment, just wondered when you started to get your feeling back? Hi!! I had double jaw surgery last week. I am completely wired shut and MISERABLE =/ I go tomorrow to my 1st f/u appt. I am hoping that they release some of these bands. I am still really sore and swollen. What should i expect at my appointment? These posts have been so helpful. I’m a week post op today! so far so good! I can talk pretty clearly, sell in has gone down massively, the bruising is starting to leave and feeling is starting to return! I can feel upper lip and up and I have feeling of sensation in my chin and left side of my face. i feel like I may have a slight over bite, if so will the orthodontist be able to correct that? You are truly an inspiration! You have helped us so much in preparing for this journey and now on day 7 and we’ll continue to use all your helpful information and humor! My daughter Kaitlynn is 17 and had double jaw surgery last Friday. The first few days were awful the on to a couple good days! Pain has not been an issue,drooling is just an annoyance! But food is the biggest struggle right now! She has a syringe with a pretty small tube to eat through but I try blending anything! Thank goodness for Ensure! Never thought we’d say that! Last night she cried because she is just so hungry! She’s a tiny girl but a good eater normally! I have a new concern and appreciation for parents who struggle to feed their children….in any circumstances! We are trying to stay positive and think of her senior year of high school, senior pics & future cheeseburgers! Thank you for creating this resource for patients as well as families helping them recover! Hello! I got jaw surgery last friday but i’ ve been reading your blog for over a year, since i was told i needed to get the surgery! It is really funnh and helpful and i am really thankfull that you shared your process here! I am on day six, and my biggest inconvenience is the drooling! I cant close my mouth yet and so ive been drooling terribly! Anyway thankyou and best wishes! Allison, always happy to help! Your “bobblehead syndrome” will go away in due time, I promise! Graham I want first thank for your blog it has really helped me a lot. I am on my 6th day of double jaw surgery. My mouth can open a little it was closed with rubber bands but they all broke off day 2 but my doctor said it was ok because the retainer is holding everything tight enough. My biggest problem is my face is bruised and now it has spreading to my neck is that normal. I am swollen but also black a blue. I also have been having a hard time holding liquids down so body feels week. I going to my doctor tomorrow to see what he recommends. I’m assuming the jaw surgery position! Sat bolt up right in bed looking again at this wonderful blog. I’m 7 days post bilateral saggital split surgery (so just the one jaw). I see my Orthodontist tomorrow, hopefully they will take my splint out and pop some bands on. I just wondered if any of you guys had it where your jaw muscles just fell asleep and I have to make a conscious effort to keep my jaw shut? Also Ive got a nagging pain in my right side? Any suggestions?